It doesn’t happen often, but over the past couple of days, I have ventured out of my home-office cave and headed into the Big Smoke for the inaugural Big Digital Adelaide Conference, held right here at the Science Exchange (pictured) in the city of churches. I admit, there was part of me that wanted to stay in my trackies and slippers and hide behind my computer screen, but I had committed to the event. And with Kate Toon coming all the way from Sydney (and others coming from the UK and US) I figured I could manage to get there from the ‘burbs. Thank goodness I did. Not only did the content teach me a thing or two about what I can do to improve my own business’s online presence, I can also use much of what I learnt to boost my clients’ digital marketing, SEO and content. So a win for everyone. While the event was jam packed with great information (for geeks and non-geeks alike), I wanted to share some highlights, for me at least. Bryant Garvin isn’t called the the PPC Dictator for nothing. This guy is possibly the first person ever to deliver an engaging presentation on Conversion Rate Optimisation (which, let’s face it, can seem like a bit of a yawn fest). Bryant has helped countless organisations improve their sales page conversions with a few simple tweaks (not just changing the colour of the “buy now” button). He spoke about mobile conversions (“It’s not mobile that doesn’t convert, it’s that your mobile doesn’t convert”); and sales page content. Check out Bryant’s website to find out more. When asked how much content needed to be on a landing page (or sales page, or home page, or whatever) Joel Klettke of Business Casual Copywriting answered “write as much as you need and then shut up”. This guy is my spirit animal. There is nothing worse than reading something that is just waffle because someone has been told that the optimal length for a landing page is 2500 words (or some other arbitrary number). And he added that the content must “educate, assist and persuade”. Joel reinforced the message from Google’s own Gary Illyes that Google does not care how many words your page is, just “write as much as you need to answer the question”. Copywriter Kate Toon (who I used to stalk on social media and now get to call a friend, in a kind of Stockholm Syndrome way) delivered an extremely informative presentation that blew a few blogging myths out of the water. No, you don’t have to blog every week, but you do have to make every blog count. She also shared the format she uses for her blogs, and great tools such as Click to Tweet and Social Locker. See her top ten tips slide below. 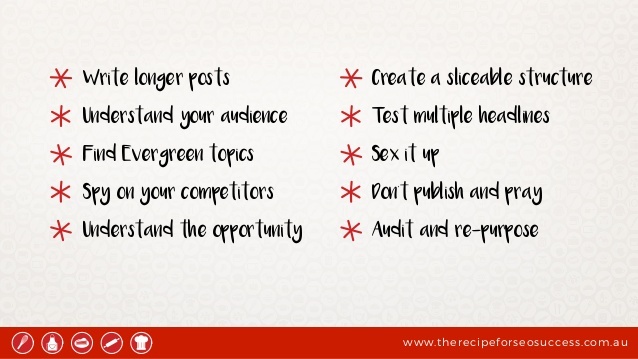 You need three ingredients – Content, SEO and Social. That was the message from Kimmy Landon and Danica Barnack of Page One Power, who went through how the three interact with each other to enable your business to reach more people and sell more product. Some of the stats they shared were alarming: 50 per cent of small business who have a website don’t engage in any SEO; and although 89 per cent of marketers agree on the importance of a holistic approach, only 29 per cent actually do it. Time to check if your online presence ticks all the boxes. Jennifer Slegg of SemPost delivered some great advice on what Google’s Panda update means for website content. Takeaways include forgetting keyword density rules, and instead just mention your keyword a few times and talk normally about it; guest posting is valid if done for the right reasons; and (my favourite!) don’t throw money away on cheap content. This is Joel again, who argues that not only are case studies powerful, they are the best asset for any business that sells products or services to other businesses. Case studies are much better than testimonials for social proof because they not only show that someone liked your work, but what your work actually achieved for their business. In all, Big Digital was one of the best value-for-money conferences I have ever attended. The speakers and content (of which this blog only covers a small percentage) were outstanding. And with streams for both geeks and non-geeks, there was something for everyone. Small business owners could learn how to get the best out of their website content, social media and landing pages; while SEO and search marketing types could keep up with the latest trends in the industry (for me, it was a little bit of both). Early bird tickets for next year’s event are on sale now. Don’t miss out!